or call 800.327.6835 and press "5" to make a payment. Use your credit card to place and pay for your order all in one quick, safe and easy process. Whether you're looking to start a new project or have an existing quote with us, take advantage of this exclusive financing offer from FarmTek. This offer will only last through April, so act now to get your farm or operation ready for the upcoming season**. Call 1-800-327-6835 now. ** Financing available on Single-Cord Structures and Truss Arch Buildings. Installation not included in finance offer. This offer expires 04/30/2019. 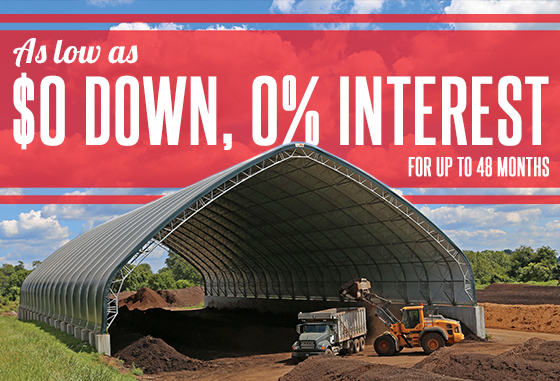 We are proud to announce a new in-house financing plan that includes rates as low as 5.99%. Whether you are adding a fabric structure or simply upgrading your light fixtures, our flexible financing plans allow you to get your projects completed. Finance as little as $5,000 by trusting your next project to us. Contact us at 800-327-6835 for more information or to begin planning your next project today. Freight truck shipments, rush deliveries and shipments outside the contiguous United States do not qualify. We accept Purchase Orders (P.O.s) from governmental, business and educational institutions submitted by authorized personnel. Whether you're looking for growth in your current agricultural business or to make the initial push to start farming, we would like to help. There are a number of hurdles that you experience in agriculture, but with Dream to Farm we can help to facilitate and streamline the process from start finish. Experience a one-stop shopping experience that is quick and easy. There are financing options that can help you to accomplish your dream to farm and we also offer educational opportunities in the form of buyer's guides, webinars and video libraries. Educational Programs – Being well informed is essential to obtaining and maintaining agricultural success and it has just become much easier with us. We offer webinars and videos to help you with Agriculture & Livestock, Greenhouse Tips, Growing & Garden and Building & Installation. One-Stop Shopping – There is everything you'll need in our catalog and on our website. You'll find fabric structures, greenhouses, high tunnels, cold frames, tools, feed solutions, growing supplies, fencing and pest control, building materials, lighting, storage, as well as heating, ventilation and cooling systems. There are numerous monthly specials and steals & deals that can help you to save money and get farming. Free Consulting – Although the website offers loads of information, sometimes you may need the human touch. With Dream to Farm you'll get free consultation for the lifetime of your product from knowledgeable farming experts. Our experts can offer help with business development, product application and general troubleshooting. Dream to Farm may be just what you need to get farming today and if you're currently farming or growing, Dream to Farm can help your business become more efficient and cost effective. You'll find everything you need in our catalog and on our website. We want to make sure that your operation is running at its peak efficiency and for this there are financing options that can help you to get that building or piece of equipment you need, educational programs and free consulting. Let us make your Dream to Farm a reality. Need help with our payment options? Contact Us or use our Live Help for more information.